Shooting for stars doesn't guarantee you three, which omakase is OMG-zy, two new south side BBQs, and whatever happened to chili parlors? Reviewing is mostly utilitarian—should I spend my money here or not?—and that’s fine so far as it goes; eating is mostly utilitarian, too. But sometimes cooking makes a bid for artistic greatness, for being the best humans can achieve in its field, and it deserves writing of equal ambition and knowledge willing to take on similar questions. In the end, the notion that you can watch a world class restaurant die and then expect to reanimate it straight back to the same level gets a serious disabusing from Nagrant: “A Michelin three-star restaurant is always a unique voice, something that doesn’t exist anywhere else, not a diluted reminder of what once was.” It’s a piece that wrestles with the profound things that make for greatness, from a reviewer informed enough to look at Chicago dining on a global scale, and it deserves reading in its entirety. Do so here. Are we feeling the rumbles of a tectonic shift in Chicago? The best restaurant in town has been Alinea for so long, it seemed as inevitable as the mayor being named Daley. And that could happen again, too! But Steve Plotnicki’s Opinionated About Dining, which polls high-roller international diners, just put out its master list of the 100 best restaurants in North America. And there are two (expensive, cerebral, tasting menu, Trotter protegé) Chicago restaurants in its top 10… but the first one isn’t Alinea, it’s Smyth, at #6. Alinea follows at #10, and Alinea Group still places Next at #58, which is no slouch, but Plotnicki’s crowd still seems to be finding Smyth fresher and more interesting these days. Other Chicago spots on the list include Oriole at #22, Schwa at #74, and others including Elizabeth, Elske and El Ideas among runners-up. See the list here. The most interesting thing to me about Brass Heart, the tasting menu spot in Uptown, is the vegan tasting menu, which chef Matt Kerney has to thread a particular needle with: “‘The hardest part of the vegan menu was definitely trying to create a cohesive menu that wasn’t stacked with hydrocolloids [thickening agents like starch, guar gum and pectin],’ Kerney says, ‘and I didn’t want to do a menu with meat substitutes, like seitan and tofu. But making sure to just not put vegetables on a plate was difficult, because there’s only so much manipulation you can do before you end up with something that requires a hydrocolloid to hold it together. '” David Hammond spoke to him for NewCity. What would you guess was the most common fast food in America, 100 years ago? Chili. Chili parlors were everywhere then, and nearly extinct now. But not entirely; Titus Ruscitti visits a few that have been around a long time including Lindy’s in the city, Bishop’s in Westmont, and others downstate. Ina Pinkney subs for Rick Bayless on The Feed, talking breakfast with Steve Dolinsky. But really, it’s just for the chance to hang out with “Brooklyn girl” Ina; this episode is like an order of her Heavenly Hots. Phil Vettel names his favorite chefs of the year, Diana Davila of Mi Tocaya Antojeria taking the top honor. I liked the Renaissance-style portraits by E. Jason Wambsgans. Crain’s picks six spots as the best for business lunches in 2019. Restaurant Week is over, which means it’s time for the fourth annual Black Restaurant Week, which started Sunday. You can see the full list of black-owned businesses participating here. I don’t always note closings, you can find that news elsewhere, but sometimes there’s one that really hurts, because I watched it from beginning to end. I’ve known chef and original co-owner Nathan Sears for years, dating back to Vie where he was the longtime number two and a mad scientist of meats and pickling, and back when The Radler was a gleam in his eye and that of co-owner Adam Hebert, I interviewed him for my old Airwaves Full of Bacon podcast, full of dreams for a lively, culinarily interesting German beer hall. By the time I interviewed the two of them again for Fooditor, they’d been battered by the reality of running a bar on a Logan Square strip, and Sears eventually left to take a hotel job with benefits for his family’s sake, while The Radler stripped down its concept to beer and sausages. Still, the food quality and level of kitchen skill remained very high—and that seems to be part of the problem, as Hebert recently announced closing due to the fact that they just weren’t making money in a big space on Milwaukee. If you can, stop in for a last chance at gemütlichkeit before closing night, February 24. 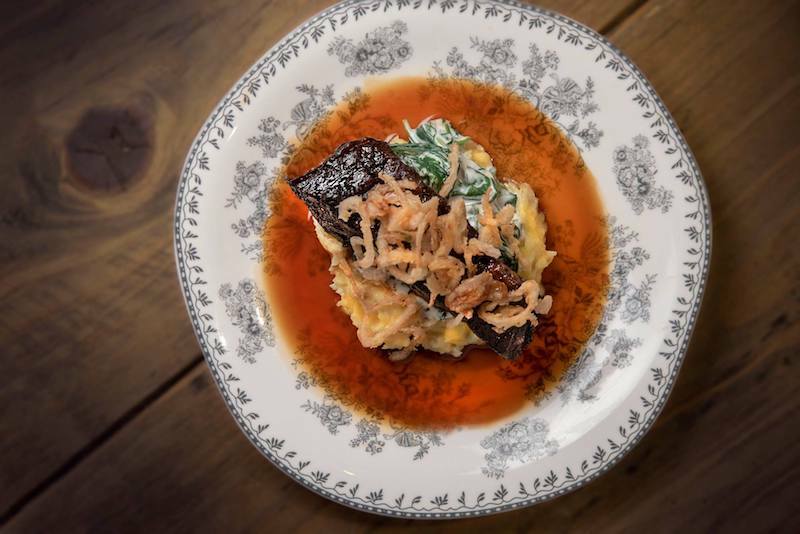 I was a big fan of Chef Lamar Moore’s breakfast food at Currency Exchange Cafe, and I love the idea of a tavern with soul bar food—which is basically what the best of Swill Inn’s menu is. Moore’s fried chicken wings are like a mini-trip south, and I loved the gas station culinary art of the taco in a bag; a couple of dishes come with an “everything biscuit,” which is a flakey, buttery biscuit with bagel stuff on it, and some kind of genius. Things that stray from that concept are less exciting—poutine was fine, but it seemed to be missing a chance to take poutine up a notch with soul, or at least more flavorful sausage than is in it now. (Hot link poutine!) So poke around the menu for the things with the best odds, but it’s a cozy getaway for hot food on a cold night.